Attention 4th - 8th graders! Do you want to help end hunger in Santa Clara County? 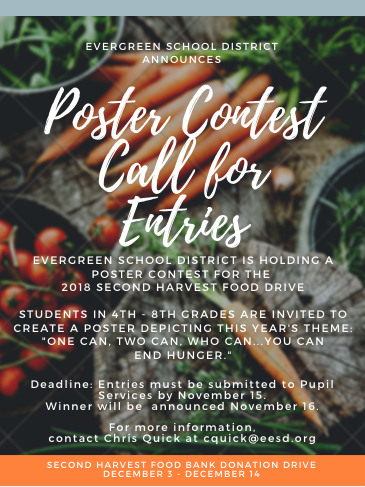 Create a winning poster to help us promote our annual food drive for Second Harvest Food Bank. The 2018 food drive theme is One Can, Two Can, Who Can ...You Can End Hunger. Our goal is to collect 35,000 pounds of food which equals 27,005 meals. The winning student's artwork will be showcased at the District Office and used for promotional advertising at each of the school sites. Gift cards to Barnes and Noble are awarded to 1st and 2nd place Elementary and Middle School Winners, Honorable Mention gifts will also be awarded to 2nd place winners. Students in 4th through 8th grades are encouraged to participate. Submit drawings on 8.5 X 11 size paper so it can be easily scanned. Your entries must be received to Pupil Services in the Evergreen School District Offices located at 3188 Quimby Road by November 15. A District Office committee will select the final winner. Winner will be announced November 16. What: Evergreen School District will host its annual holiday food drive to collect food for Second Harvest Food Bank to give to families in need in Santa Clara County. Our goal for Evergreen School District this year is 35,000 pounds of food = 27,005 meals. When: The holiday food drive takes place Monday, December 3- Friday, December 14. Where: Families from 16 elementary and 3 middle schools throughout the Evergreen School District will have an opportunity to donate these types of non-perishable foods. How: Large cardboard barrels will be placed at each school to collect donations of non-perishable food. To make a tax deductible financial donation online, go to www.shfb.org/donatenow. Contact: Chris Quick in Pupil Services for more information. 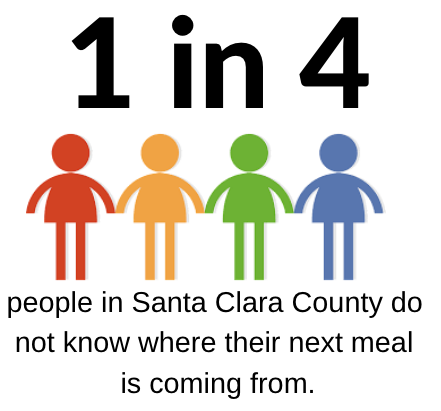 1 in 4 people in Santa Clara County don't know where their next meal is coming from. Second Harvest Food Bank (SHFB) provides food to low-income people in need in Santa Clara and San Mateo Counties. It's the second largest food bank in the nation based on pounds distributed per person in poverty. The amount of food SHFB distributed is equivalent to 35 million meals. Last year Evergreen School District collected 31,235 lbs of food which = 24,026 meals. We were the only School District in the San Jose area awarded by Second Harvest with a " Hunger Hero" Award.